Just testing a little utility used to post pictures on the blog. 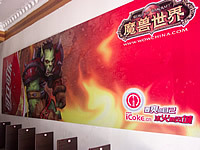 This one is of a type of billboard that has been showing up in Dalian lately. Coke and World of Warcraft (a computer game) have teamed up to do some advertising. I didn't get a chance to post a message here like I had hoped this weekend. From Friday night until Sunday morning I couldn't access any internet sites outside of China. I'm not sure if it was my ISP, or if it was something the goverment did, or what. I was talking with a neighbor and he said it happens all of the time. There hasn't been too much going on outside of work worth talking about lately. We're trying to get a lot done before the Labour holiday coming up in May. Normally it runs from the 1st to the 7th, but since my team supports some global programs that run at the end of the month and the first two days of the month, we're going to work on the 1st and 2nd. Then we'll get the 8th and the 9th off. I haven't really decided what I'm going to do with my time off yet. I might just wander around Dalian and see more of the city. This week I have been dealing with banks. China keeps pretty strict controls on their monetary supply, and trying send money out of China has been a bureaucratic nightmare! All I wanted to do was wire a few hundred dollars back to the US. I went to the China Merchant Bank (CMB), where I have an account here, and it turns out they don't do wire transfers to the US. The only bank here that does is the Bank of China (BoC), so the next day I withdraw some chinese currency (RMB) from CMB and head over to the BoC. The only BoC branch that does wire transfers is in the center of town, so it takes awhile to get there. After I get there they say I need to exchange my RMB for US dollars, but in order to exchange RMB into dollars I need to have exchanged US dollars into RMB within the last 6 months, and I had exchanged traveler's checks instead of cash, so I couldn't do that. But I could exchange RMB into dollars if I could provide a payroll statement, tax id number, passport, work visa, etc... So I left the bank and went to work. At work I asked for my tax id number, and was told that I could get that at the end of the month when I get paid. Then I figured I would ask the bank in the US if they would accept a wire transfer of RMB. They said, "Sure", so the next day I head back to the BoC. This time I took the bus, which is cheaper than a taxi, but takes twice as long to get there. I get to BoC and tell them I would like to transfer RMB to the US, and they say they can do that... as long as I have a payroll statement, tax id number, passport, work visa, etc... . I figure, as long as I'm here I'm going to open an account here and start having my pay deposited to the account here. That way when I transfer money in the future I can cut the trip to CMB out of the ordeal. It took awhile, but I finally get an account setup. There's a bunch of services I want to add to this account, such as online banking, etc..., but I'm so tired of dealing with bankers that I figure I can do it on their website. After I leave there I logon to their website, which is in both english and chinese, except for the application forms which are in chinese, so I get a friend to help translate them and enter my information. Of course, that didn't work and now I have one hell of a headache. It looks like I'll be heading back to BoC next week. I've been neglecting my blog lately. A lot has been going on, but they're little things that I hadn't planned on writing about, but what they heck. I'll write about them. Our office here is taking on so many new people that we're moving to a bigger office building after the chinese labor day holiday. I haven't been over there to look at the new offices, but I've heard it's nice. The people who are planning the move have been talking about inviting the press and having a fireworks show the night the new office opens... I didn't think anyone would care. Maybe they won't. It rained last Saturday. We don't get a lot of rain here and a few of us had planned to go do some shopping, but decided to wait until next weekend. I spent the day cleaning and catching up on my sleep. A few of us in the office decided to hire a chinese language teacher and we'll be starting lessons in the middle of May. Right now there are only three of us taking the class... one person from India, one from the Netherlands, and myself. I'm looking forward to being able to speak at least some basic chinese. I'm still taking my Tai Chi lessons, but I haven't had any time to practice. I need to start doing that... some time. I decided the laptop the company issued me isn't powerful enough to run my own applications (i.e. games), so I decided to buy a desktop computer with some power. There isn't a lot of demand for the newest and most powerful computer setups here, so it's one of the few things I've found that cost more here than back in the US. So, instead of buying a new computer here I'm having my computer from home shipped over. Some of my friends back home have convinced me to try Everquest again. We all played on different servers, so we never got to group together in the game, but with all of the servers going through mergers and Sony offering to move characters to other servers for free I decided to join them. We still haven't decided what server we're moving to yet, but hopefully we'll decide by the time I get my computer. One of the local TV channels was showing When Harry met Sally last night (it was in chinese, or course) and I noticed that they cut the fake orgasim scene. It's interesting what they consider pornographic here, compared to the west. The fact that they cut the scene was almost as funny to me as the scene itself. Every once in awhile I hear a big boom in the night. I had no idea what it was, but I think I figured it out... popcorn! When the street vendors that sell popcorn here make popcorn they cook it in a sealed pot that is shaped like a little cannon and when it's done they attach a long net to end of the pot, and when it opens out shoots the popcorn into the net. BOOM! Friday night a few of us from the office went to a new place to eat. It is similiar to a korean barbecue, and they even included korean on the menu, but it was a little different than when I was in Korea. Then again, I haven't been to Korea in twenty years, so things might be different now (or my memory isn't as good). The main course was a lot of different types of beef and that was good. The appetizer was dog meat, and I didn't care too much for that. The next day I had to work and my stomach wasn't feeling that great (I think it was the dog), but it felt better by the end of the day, so I went to Pizza Hut and had some pizza and a salad. That helped. On Sunday I had Tai Chi in the morning and after class a friend took me to a cigarette store that sold Marlboro Lights for a $1 a pack. I bought a carton! The street where the store was had tons of both little stores and street vendors, and I had no idea where I was, but I remember the bus route numbers. I hope I'll be able to find that place again.